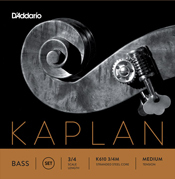 Kaplan are professional steel rope core strings from D'Addario. These have a powerful orchestral response in the Medium or Heavy gauge. For a mix of solo pizz playing and arco, choose the Light gauge. Kaplan are priced lower than many imported brands with similar performance.